Practicing relatively simple arm balances such as Vasisthasana helps to build the upper body and core strength we’ll need when approaching asanas such as Bakasana, Koundinyasana, Urdvha mukha vrksasana (handstand), or Astavakrasana. Strengthening the upper body helps to cultivate Tapas – no, not the Spanish food…. Tapas is part of the Niyamas; the second limb of the 8 Limbs of Yoga. The Sanskrit word Tapas comes from the root word ‘Tap’ which means ‘to burn’ and therefore ‘purify’. In this instance we can apply Tapas to the sense of inner fire we feel in an intense yoga practice, and a sense of discipline – which is also needed to head deeper along the yogic path. Vasisthasana has lots of variations, but in its most simple form, this asana is available for most of us to practice and can easily be included in a well-rounded daily practice. Prepare for Vasisthasana by practicing Downward facing dog and plank pose, holding each for a few rounds of breath to test your strength. If you’re warming up for the full expression of this asana, with the top leg raised to the sky, then lengthen the hamstrings with Supta Hasta Padangusthasana A and B, Prasarita Padottanasana, Parsvottanasana, and Ardha Chandrasana (half moon pose). 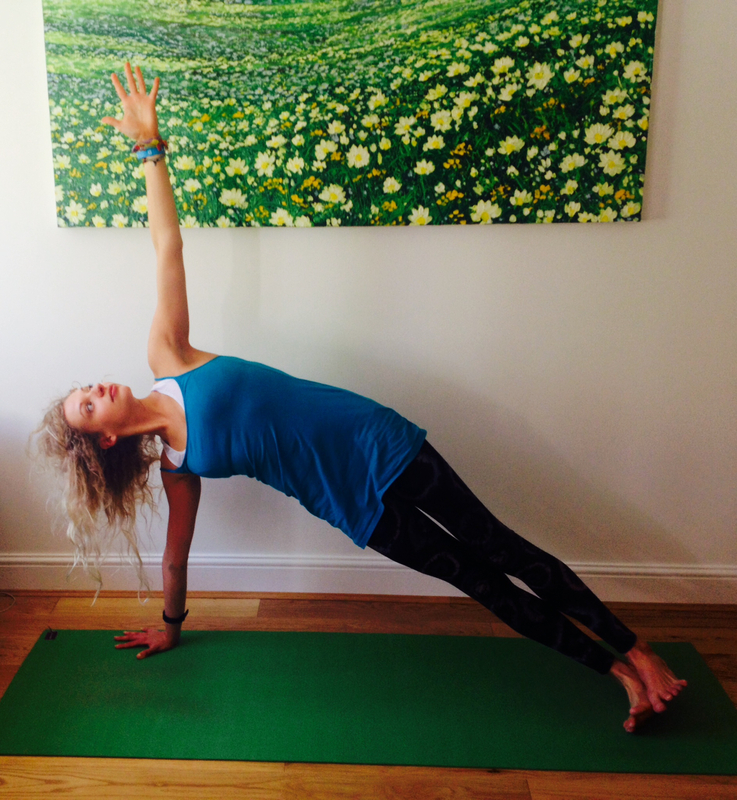 From Adho Mukha Svanasana (Downward Facing Dog), pull forwards slightly towards plank pose, and shift the weight on to the [right] hand and outer edge of the [right] foot, bringing the feet to stack on top of each other (if this feels too strong, the bottom foot can be placed slightly infront of the top so that both feet are on the floor, giving more support). Open the body to the side, lifting the [left] hand up to the sky. Take the weight out of the wrists by maintaining hasta bandha (the same sensation you’re working with in Downward Facing Dog), and pressing the floor away while pulling the navel in and lifting the hips up. 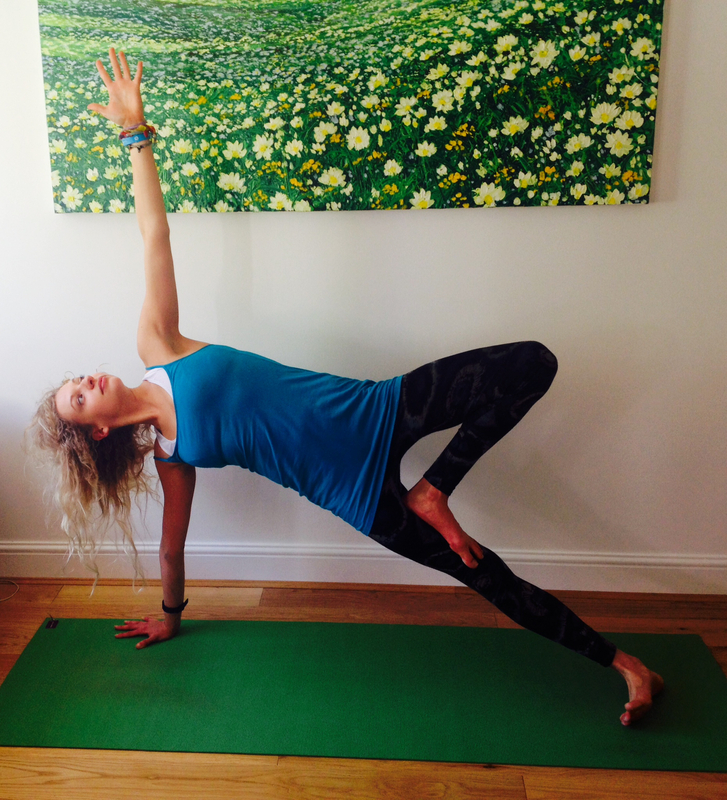 *Thinking of arm balancing poses as ‘lifting up’ really helps to create a sense of lightness, rather than a feeling of supporting a heavy weight on the arms. I recently heard a teacher say ‘Bakasana is handstand’, which may sound strange to most people, but if you imagine lifting the whole body up in to a handstand from Crow pose (even if you’re not doing handstand yet), it creates the same sensation of lifting up, rather than plonking the weight of the body on the arms….. try it! To come out, bring the [left] hand and [left] foot back to the floor and press back in to downward facing dog before moving on to the other side. *If you’re practicing with a wrist injury, or don’t feel as though your wrists are strong enough to support this pose yet, practice on your forearm at first. *When you feel good in this position of Vasisthasana, move on to lifting the top leg up and maybe holding the top foot; bending the top leg and holding the ankle in ardha Dhanurasana (half bow position); or placing the top leg in vrksasana (tree pose) position. To counterpose, rest on the knees and move through some gentle wrist therapy.